The International Space Station as seen in orbit around Earth. NASA is not currently willing to comment on what caused the leak. "Right now, we're working on just making sure that the leak is stable and that we can fix that, and then we'll consider the causes," NASA spokesperson Brandi Dean told Space.com. Dean declined to comment further about how that process will play out. But something penetrating through the wall of the space station could also have caused the leak. According to reports from the Russian News Agency, Russian space agency staff members have stated that the incident may have been caused by an impacting micrometeoroid — a tiny piece of rock or other material. Such an object may sound harmless, but the International Space Station and everything else orbiting in space travel at speeds of at least 17,500 mph (28,000 km/h). At speeds like that, if orbits don't align, even the smallest of impacts pose dangers. Larger human-made debris in space, the size of a softball or bigger, is tracked from the ground, and if it appears to threaten the International Space Station, the orbiting laboratory is maneuvered around the material. But there's no way to track tiny pieces of natural and artificial debris, which abound in the station's orbit. 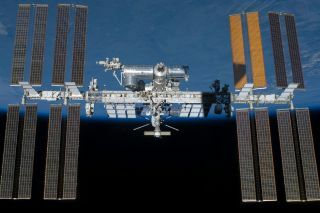 The main body of the space station carries shielding to protect it from impacts, but this leak occurred in a transport module only recently and temporarily docked to the station until December after carrying three astronauts to the orbiting lab in June. "The fact that it's a Soyuz capsule, that may well mean that it has very little or no shielding," Robert Culp, an aerospace engineer at the University of Colorado Boulder, told Space.com. But Culp said he was still surprised when NASA reported the leak was about 2 millimeters (0.08 inches) across. "If it's a micrometeor, then [an impact] is not unusual," he said. "The size of it is unusual, the fact that it actually penetrated is very unusual." Natural micrometeoroid impacts more often result in grazes than actual punctures, he added. Nonetheless, he emphasized that the current incident isn't cause for concern, because the space station experiences tiny impacts all the time. "It's not a big deal. It's under control, and it's something that we should expect to be happening at the space station," he said. This isn't the first time the space station and its components have sprung a leak, but it can be difficult to get to the bottom of individual incidents. "These leaks have been very small and tiny, and that's the problem — because they're so small and tiny, it's difficult to figure out what happened," Crassidis said — although the small size makes for easier patchwork, at least.